I teach yoga therapy, the therapeutic application of yoga developed specifically to help heal damaged bodies, minds, and spirits. My “students” at the Los Angeles Veterans Administration (VA) include a wide range of veterans, from the Vietnam era all the way through recent conflicts in Iraq and Afghanistan. These folks typically suffer from PTSD, traumatic brain injury (TBI), physical disabilities, drug and alcohol addictions, as well as depression and homelessness. They are housed in the VA’s inpatient center for a 3- to 6-month healing support program, with some staying longer. I work directly with the psychologist in charge of the Combat Track, which handles, as the name suggests, our most highly stressed patients. See a clip from one of Anne’s classes here. My approach is tailored to manage the unique energy and ability of each veteran, so I generally have several practices going on at once during the same hour-long class. Some students use a yoga mat, whereas others, depending on their needs, practice seated in a chair. We emphasize specific breathing methods designed to reduce stress and encourage positive focus in the meditations that end classes. Each session begins with setting an intention that encourages this positive meditation. Examples include gratitude, freedom, joy, trust, and release. The intention becomes a thread that connects us throughout the hour. To keep things interesting, I like to arrange special classes involving musicians. Def Leppard drummer Rick Allen and Lauren Monroe of The Raven Drum Foundation recently gave us a brilliant drum circle in the VA Rose Garden. Bob Dylan’s favorite violinist, Scarlet Rivera, has played for us on more than one occasion. Once we get the word out, we’ve found the music community eager to help. Their creativity and passion help set the tone—and give the students great joy! Anne Platt, C-IAYT, RYT 500, co-created the yoga program for the Greater Los Angeles Veterans Administration. 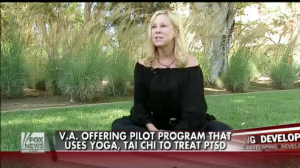 She has been teaching yoga at the VA for 14 years and has completed Loyola Marymount University’s yoga therapy program. Love from Larry Payne Ph.D.
Perry, thank you for your thoughtful comment. As a long-time friend of Dan Libby and former VYP regional director, I am very familiar with this organization’s great work. I have completed the Mindful Resilience training – and as you suggest, found it most valuable to my practice. I am always interested in improving my yoga classes, and would be happy to discuss. You are the Light Annie! Your have gift for healing and the dedication to see it come to fruition! Our He-ro’s and She-ro’s deserve nothing less!!! Love You Dahli Mama!!! Founded in 1989, the International Association of Yoga Therapists (IAYT) represents more than 5,600 yoga and healthcare professionals working in more than 50 countries.